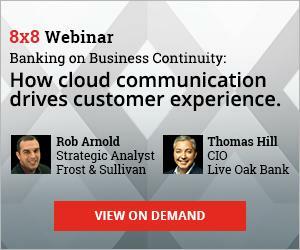 Blurring the Lines of Enterprise Communications | 8x8, Inc. 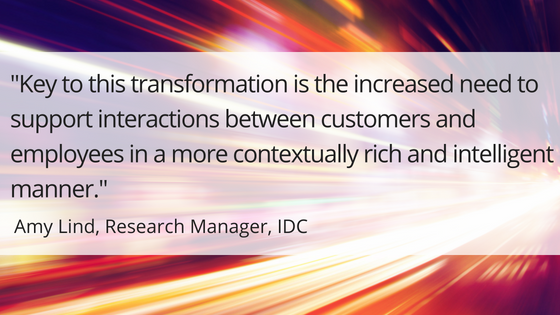 This is a guest blog post by Amy Lind, research manager at IDC. 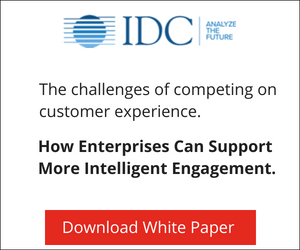 Customer engagement models and expectations are changing. As organizations increasingly compete on customer experience (CX) and engagement, senior managers are being tasked with transforming their company’s CX. Key to this transformation is the increased need to support interactions between customers and employees in a more contextually rich and intelligent manner. An array of communications capabilities exists in most companies but often, they are individual point solutions that don’t fully address the underlying needs of the organization or its customers. Each interaction is a single touch point rather than a series of engagements within the customer journey, making it challenging to extract key insights into employee and customer interactions and behavior. Many organizations, large and small, also struggle with fragmented infrastructure and disjointed solutions for voice, contact center, collaboration, and conferencing, which leads to an incomplete view of customers and dissatisfaction for both customers and the employees serving them. The enterprise communications market is quickly and dynamically evolving from individual point cloud products—i.e., phone, messaging, video meetings, and Contact Center as a Service (CCaaS) that were developed as individual pieces of solutions focused on the employee or customer—to cloud-based, fully integrated enterprise engagement solutions focused on the employee and the customer. Enterprise engagement solutions are intelligent, integrated, cloud-based solutions that deliver a system of intelligent enterprise engagement. Employees and customers can easily move from one communications channel to another—from a desktop phone to a mobile phone or from an online chat to a voice call —all with complete context and one-click advancement of the engagement. Such solutions are flexible, configurable, and provide an integrated employee and customer experience that combines the collective power of the enterprise. Thus, rather than passing a customer from one person to the next or waiting to get the relevant expert involved, enterprise engagement solutions harness the power of all employees and data across the enterprise to solve customers’ problems faster by bringing the right subject matter experts, both internal and external to the enterprise, and critical data together at the precise moment of interaction. Enterprise engagement solutions also enable real-time analytics that provide data-driven insights and intelligence from every customer touch point across the organization, allowing for better decision making. Until recently, there was little reason to integrate communications and collaboration with contact centers because the former is predominantly about internal communications, while the latter is primarily customer-facing communications. However, the advent of cloud gave rise to Unified Communications as a Service (UCaaS), making communications and collaboration easy-to-implement and affordable for organizations of all sizes. In the contact center, CCaaS is rapidly gaining traction for similar reasons. As a result, the lines between UCaaS and CCaaS are blurring together. Integrated UCaaS and CCaaS within an organization streamlines the benefits of both to solve customer-facing issues, provide access to the right internal and external resources, and improve CX and customer satisfaction. A key aspect of being more customer-centric across the entire organization is enabling all employees to be customer-facing. Contact center agents can access expertise inside and outside the organization and employees that have not been customer-facing are able to engage more directly with customers to deliver better CX and improve customer satisfaction. Enterprises are engaging in digital transformation initiatives precipitated by the need to upgrade aging technology and the growing desire to compete on new customer business models and increased customer intimacy under the CX banner. For many enterprises, the siloed communications systems of old were built to solve point problems; but these systems often further reinforce the breakdowns that slow the pace of doing business. Forward-thinking businesses are looking for communications solutions that reinforce connections between employees and customers and all their devices, apps, and modes of communications. Thus, bringing contact centers into this merged communications ecosystem means a connected real-time, integrated, and holistic environment that enables organizations to communicate internally more quickly, be better aligned and aware of customer needs and respond rapidly and in context. As more organizations digitally transform and focus on the CX, adopting an intelligent, integrated communications, collaboration, and customer engagement solution is the wave of the future. Amy Lind is a Research Manager with IDC’s Communications Services practice and a leading member of the Unified Communications and Collaboration (UC&C) research team. Ms. Lind’s core research coverage includes the evolution of IP voice and UC&C services and communications service provider (CSP) positioning and business model innovation. She assesses the migration of business communications from legacy TDM to IP-based, integrated communications and collaboration solutions and evaluates enterprise adoption of VoIP and UC&C. Ms. Lind also provides in-depth analysis of telecom carriers and cable operators strategies for deploying and marketing fixed broadband and voice services to consumers. Previously, Amy was a research specialist with Accenture’s Communications and High-Tech strategy practice and with The Boston Consulting Group’s High Technology and Telecommunications management consulting practice. She also previously worked as a research analyst for IDC’s Investment Research program where she was responsible for many of IDC’s large financial and consulting accounts.